WIAW~So How Was YOUR Week? How do we always seem to get back around to Wednesday so Quickly?! Well, here it is again and that means it’s time to gather where all the bloggers are friendly and all the food delicious…Peas and Crayons…the crazy domain of Jenn the gracious hostess and creator of What I Ate Wednesday! Be sure to check out all of the fun over there when you’re finished here! This was a fun week but not one I’d necessarily confess to my friends at Weight Watchers. Regardless, it was an interesting mix of things. 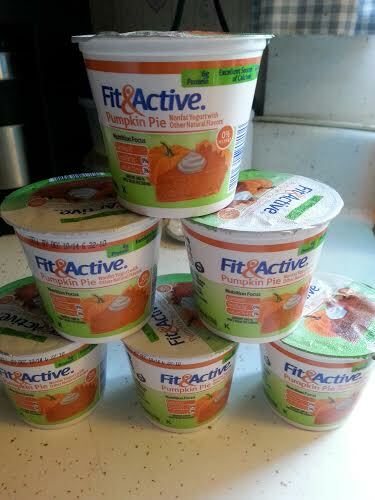 I give you a Tower of pumpkin pie yogurt. Aldi had these two weeks ago and I bought 2 because it sounded good. You can never be sure with these specialty flavors…sometimes they’re good, sometimes not so good. This is delicious and the next time I was there, I had my fingers crossed that there would still be some left. Yes!! I’ve been going through these pretty fast. It’s very tasty! Another pumpkin shot. 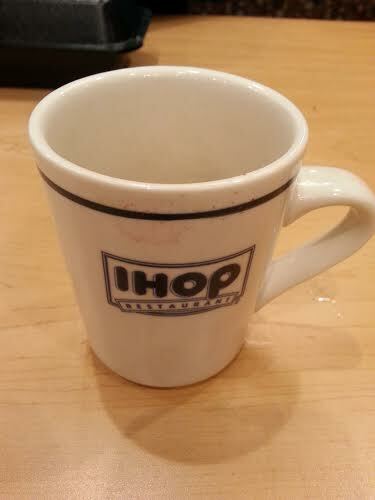 Ok, I realize that it looks like an empty IHOP coffee cup. It is. But where there’s IHOP…there’s pancakes…and for me this time of year it had to be pumpkin pancakes. I did ask for them with no whipped cream and I used the sugar-free syrup. They were also delicious! I’m so glad there’s Not an IHOP closer. That would be dangerous. One afternoon last week, Ralph and I decided to go to one of our favorite nearby Italian restaurants. Usually, we only get salads or sandwiches. But this was late afternoon and almost dinner time so we decided to have a real dinner. We were both Very pleased. I started off with a salad. This was huge for a dinner salad and it was delicious. I got it with the balsamic vinaigrette. So good and really very filling. This is their bread with the seasoned oil. This bread is So delicious, I could go in for just that. Always crispy on the outside and soft and fresh and warm on the inside. Yum. Finally we get to dinner itself. I’m usually pretty much a pasta girl but their special that night was Gnocchi Siciliano. This was basically gnocchi, which I’ve never had before, with eggplant, tomatoes, a creamy sauce and CHEESE! It was amazing. I only finished about a third of it. I took it home and had it for dinner the next night. This was so good and so over the top as far as trying to figure out the Weight Watchers Points that I think I wrote down 15 Points for it the first night and 20 Points the next night. At least I’m honest when I write down my Points…Good or Bad…I write them down. That’s my WIAW post for this week. If you want (need!) more just stop by Peas and Crayons…You’ll find what you’re looking for! This entry was posted in Uncategorized and tagged coffee, Weight Watchers, WIAW, yogurt. Bookmark the permalink. Oh, Liz, the food there is Wonderful and yes, thought not exactly Points friendly…totally worth it. Have a great day! Thanks, Andrea! The yogurt is incredible. I’m being very stingy with it! So Good! Have a great day! Thanks for visiting, Kammie! It was all wonderful! It was just delicious! Thanks for visiting!